Did you know that every year about 3 million people, mostly kids, eat or have contact with a poisonous substance? National Poison Prevention Week is observed from March 18 – 24, 2018 in an effort to raise awareness and help protect children from accidental poisoning. The American Academy of Pediatrics (also called AAP) has developed recommendations that parents and caregivers can follow to protect little ones from accidental poisoning. Keep medications in their original packaging and in containers with safety caps. Store them away from children. Please note that the safety caps are designed to be child resistance, but that doesn’t mean they are fully child proof. Safely discard any unused or expired medications. Store cleaning and laundry products (especially detergent packets), paints, windshield wiper fluid, antifreeze, kerosene, gasoline, lamp oil and pesticides in locked cabinets or containers. Keep them in their original packaging and out of sight and reach of children. 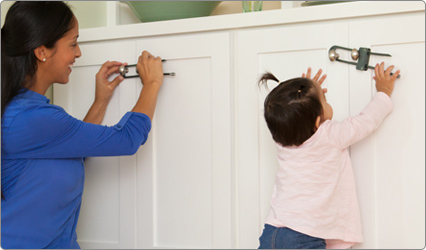 Install safety latches and make sure they automatically lock when you close a cabinet door. But keep in mind these devices can also malfunction or a child can defeat it. It is best to store poisonous products in a place that your child can’t reach or see. When giving medication to your child never refer to it as “candy.” Always use a dosing device and double check the label to ensure proper dosage. A kitchen spoon is never a substitute for a dosing device. If you have questions about the dose of a medication, call your child’s health care provider. Secure devices that may contain small buttons or coin batteries. They can be dangerous if ingested. For example, remote controls, key fobs (for cars), greeting cards, holiday ornaments, thermometers, musical children’s books, toys and many others. Find out the names of all plants in your home and garden. If any of them are poisonous, remove them. Before buying a plant, find out if they are poisonous for children or your pets. Ingestion or skin exposure of e-cigarette liquid (even just a small amount) can be fatal to a child. If you or anybody in your house uses them, make sure they are out of reach and sight of children. Some of them come in child resistant packaging, but that doesn’t mean they are child proof. • Be extra alert if you have visitors during a special event or holiday gathering. Many poisonings occur during busy times. Make sure drawers and cabinets that are usually locked stay that way. If you’re having company, consider hiring a babysitter or ask a family member to help you keep a close eye on your little one. If you think your child may have been poisoned, stay calm but act fast. Call the toll-free Poison Help Line at 1-800-222-1222, which will connect you to a local poison center. Save this number on your phone or make a note of it in your house, near your house phone or your fridge. Do not wait to see if your child shows signs of poisoning. Even if you are not completely sure if your child has consumed a poisonous substance, make the call. It is best to have a poison expert on the other end of the line who can help you and tell you what to do.